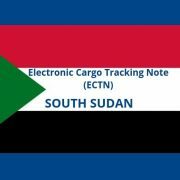 For shipments from and to South Sudan an Electronic Cargo Tracking Note is mandatory as from April 1st, 2019. The shipper or his forwarder is responsible for arranging this waiver in the port of loading and the unique number must be mentioned on both Bill of Lading and manifest as from April 1st, 2019 ( B/L date). If this waivernumber is missing, the cargo cannot be cleared by customs in South Sudan and fines may apply. More information about ECTN ?